We recommend changing sediment filters when they become visually dirty or there is a noticeable drop in pressure. Change carbon blocks every 6-12 months depending on use. 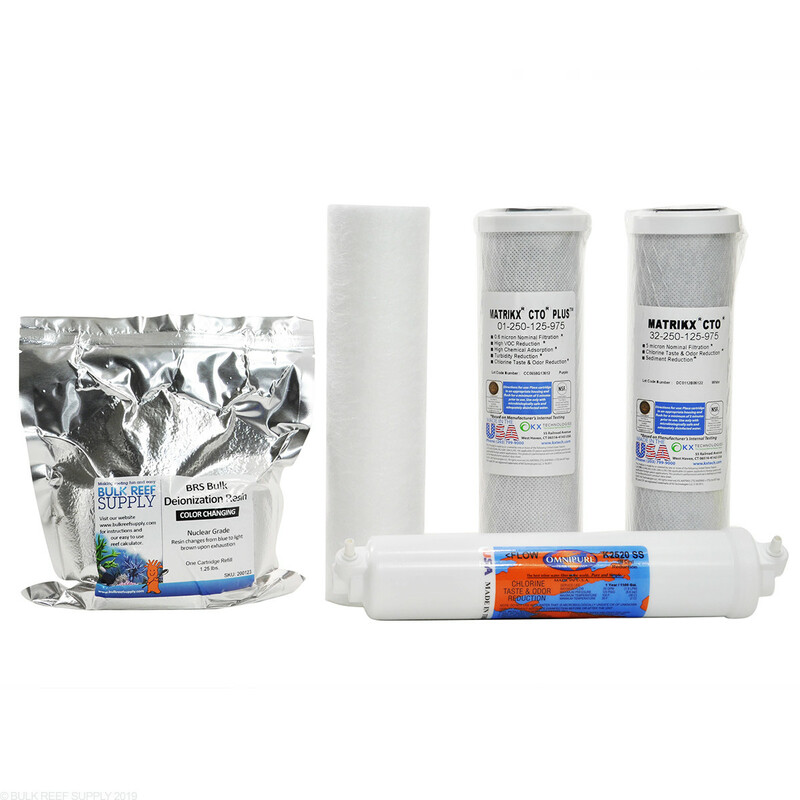 This kit does not include a membrane filter as they need replacement every three years or so, depending on water and set up. Our filter kits feature some of the most widely used and trusted brands in the world Including GE, KX Technologies, Pentek and Omnipure. The 10” filter size is the industry standard and will fit our systems as well as virtually every brand of RO system that uses similar looking carbon blocks. Most of the filters included in our kits are NSF Certified or WQA Gold Seal Certified and Manufactured using FDA-compliant materials. *This is our recommended filter arrangement and we have found to be the best combination for the most common installations and water conditions. If you have something unique about your water supply or installation please contact customer service and one of our certified water specialists will be able to assist you. Our onsite chat feature is the quickest way to receive advice but we are available to assist via the phone and email as well. We have HIGH chloramines in area and reading between 290 and 333 TDS. I have been able to get my other system to produce between 5 and 12 TDS... Put this in and 0 TDS right out of the box. Thank YOU!!! I have used these filters for 2 years now. In that time I have had great tasting water, excellent reef water and excellent general purpose lab grade water for our science labs at work. I would and have recommended thsese to friends and coworkers. I have been using this filter kit for several years now and they seem to last for a good long time before I need to change them. I trust them because they are made in the USA from companies that have been around for a while and are not some unknown generic filters from china. Good for both reef & drinking and the price is nice. BEST TASTING WATER EVER, GREAT VALUE FOR THE PRICE TOO. Great water quality for the reef enthusiast. Prompt shipping and high quality filters. We drink a lot of water in our house and the cost of bottled water was too high. We also have a 65 gallon reef tank so out water demands are high. These filters are easy to change and we really notice the taste and production rate is much higher with our system. When I shopped for replacement filters for my RO unit, I checked prices on ebay, amazon.com, google shopping, etc.- I also checked brick and mortar stores in my area (Long Island, NY). No one could beat the delivered price of this set of filters/ DI media once I factored in shipping/ tax. The plus for me is that every one of the replacement filters is a BRAND NAME, MADE IN USA product. Well done to Bulk Reef's owners! 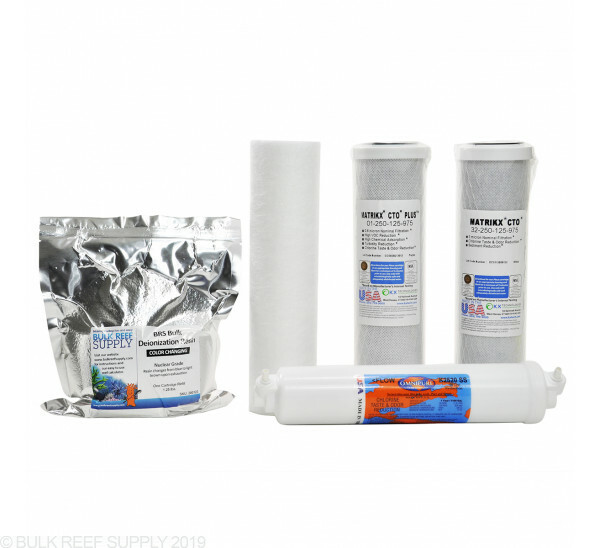 Our 5 stage Drinking & Reef and PLUS system recommends the replacement filter kit SKU200106, however we only need the Omnipure Inline Carbon Block. This kit shows it with a part # of K2520 SS. When I search your sight for this particular one I can't seem to find it. Is it possible to buy it on its own? Or is there another part # that will still work with our system? We do have the omni pure inline carbon block available separately. I have included the link below. Feel free to let us know if you have any further questions! BRS 5 Stage PLUS RO/DI System - 75GPD SKU 200403. I'm trying to purchase replacement filters. I see you no longer carry this model. I just ordered this set of filter from you and received them, but they look too small to fit in the canisters. Do they expand? I don't want to open them and test it in case I ordered the wrong ones and need to send this back. Please help. Many thanks! These filters are identical in size and often due to the shape of the plastic on the canister the installed filters appear larger however these are a universal size which will work perfectly for you!